The Kilbourn Public Library Book Club is open to all adults interested in getting together for informal discussion on selected books. 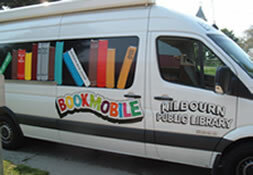 Each month a book is chosen and copies are available here at the library and on the bookmobile for interested readers. The book club meets at the library on the last Monday evening of the month at 6:30 p.m. and the last Wednesday afternoon of the month at 1:30 p.m. to discuss the featured book. Coffee and treats are served along with engaging and enjoyable discussion. Copies of the book are available at the library and on the bookmobile. Everyone is welcome. If you can't make any of our meetings, post your comments and thoughts on our Book Club Blog. The Kilbourn Public Library Book Discussion Group will be reading Boar Island by Nevada Barr. Ann Pidgeon, in her career as a National Park Service Ranger, has had to deal with all manner of crimes and misdemeanors, but cyber-bullying and stalking is a new one. The target is Elizabeth, the adopted teenage daughter of her friend Heath Jarrod. Elizabeth is driven to despair by the disgusting rumors spreading online and bullying texts. While trying to deal with the fragile state of affairs, and to find the person behind the harassment, Elizabeth's mother and Anna decide the best thing to do is remove Elizabeth from the situation. So they move to Acadia National Park in Maine to stay with Anna. But the move east doesn't solve the problem. The stalker has followed them. Boar Island is a brilliant intertwining of past and present, of victims and killers, in a compelling novel that only Nevada Barr could write. The Kilbourn Public Library Book Club will be discussing this book on Monday, March 25 at 6:30pm and Wednesday, March 27 at 1:30pm. If you cannot make it to either of these sessions, feel free to join the discussion online at kplbookclub.blogspot.com. Everyone is welcome! For January Book Discussion, we will be reading and talking about In The Midst of Winter by worldwide bestselling author Isabel Allende. This is a sweeping novel about three very different people who are brought together in a mesmerizing story that journeys from present day Brooklyn to Guatemala in the recent past to 1970s Chile and Brazil. The story begins with a minor traffic accident which becomes the catalyst for an unexpected and moving love story between two people who thought they were deep in to the winter of their lives. Discussion on this book will be held on Monday, January 28 at 6:30pm and Wednesday, January 30 at 1:30pm. If you cannot make it, please make use of our online discussion blog at kplbookclub.blogspot.com. Everyone is welcome!